The review aggregator site claims the previous year "paled in comparison" when it came to high-scoring reviews. Review score aggregation: love it or hate it, it has considerable influence on the gaming industry, especially when you hear of companies using aggregated scores to screen potential job applicants. Metacritic, the site dedicated to compiling review scores and breaking down video games to a single number, has released a report on the best video games of 2012. In short: there weren't all that many. The feature post stated that the past year "paled in comparison" to other years when it came to quality video games, which are titles that scored an average score of 90 or above. "Just 14 console games - and 18 products overall, including PC and handheld (non-iOS) titles - scored 90 or higher in 2012," the report says. "Those figures represent a huge drop from the previous year, when 23 console titles (and 32 games overall) met or exceeded the 90 mark. "In fact, since we started publishing these year-end reports in 2009, we have never encountered such a low total number of great games in a single year." That's not much historical data to go on, but the marked drop in high-scoring games is noteworthy. 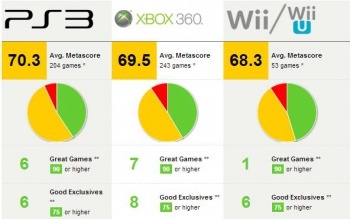 The report also presented statistics on how the consoles fared in 2012: the PS3 nosed in front with the highest average Metascore of 70.3 for its releases, while the Xbox 360 offered the highest number of 90+ games and "Good Exclusives". The best reviewed game for the year went to Telltale's The Walking Dead, with an average score of 95.